THE SUN IS A VARIABLE STAR: The Solar Dynamics Observatory (SDO), slated for liftoff on Feb. 9th, will make IMAX-quality movies of solar explosions, peer beneath the stellar surface to see the sun's inner dynamo, and--researchers hope--unravel the mysteries of solar variability. Get the full story from Science@NASA. 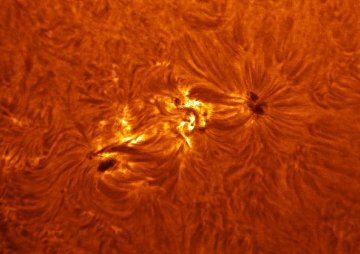 The active region is crackling with solar flares. The strongest so far is an M2-class eruption at 1900 UT on Feb. 6th. (See the movie from NASA's STEREO-B spacecraft.) Each of the spot's dark cores is about twice as wide as Earth, which makes it an easy target for backyard solar telescopes. Stay tuned for solar activity! The spectacle attracted sightseers from hundreds of miles around. If you plan to be in Florida this weekend, here are some places you can watch the launch in person. Otherwise, tune in to NASA TV for full coverage. 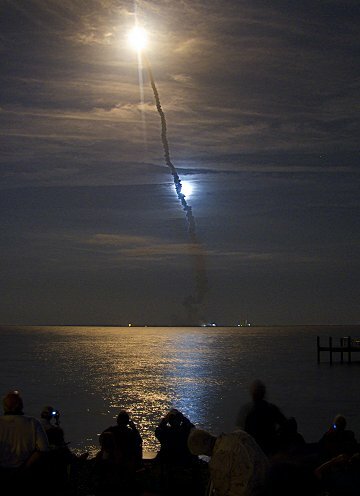 EXTRA: "And if you can arrange to be at azimuth 40 degrees (WNW) of the launch site, you'll have a crescent moon in the background," notes University of Kentucky astronomer Timothy Knauer. "Photo-Op alert!" On February 6, 2010 there were 1094 potentially hazardous asteroids.